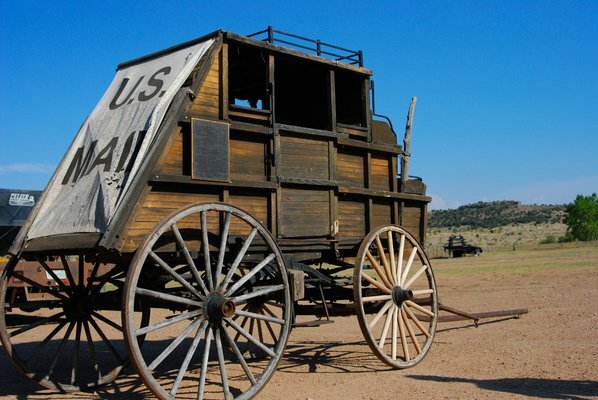 An authentic stagecoach stands on the grounds of Hitching Post Lodging & Ranch in Kenton. Guests can stay at the ranch and enjoy horseback riding in the great outdoors. Load your wagon up for a trip into the cowboy Taj Mahal a.k.a. the National Cowboy & Western Heritage Museum in Oklahoma City. Art collections and exhibits include the works of master artists such as Charles Russell, Frederic Remington and Albert Bierstadt. Visitors won’t want to miss James Earle Fraser's famous 18-foot sculpture “The End of the Trail,” while little cowpokes may have more of a hankering for the museum's Children's Cowboy Corral or Prosperity Junction, a full-scale model of a Western town. To shop-until-you-drop Western style, head over to Oklahoma City's Historic Stockyards City, a unique Western district that offers more than 70 businesses specializing in Western wear and rustic furniture, plus farm and ranch needs. If all that shopping wears you out, refuel at Cattlemen’s Steakhouse, a favorite dining spot in Historic Stockyards City and Oklahoma’s oldest continually operated restaurant. Cattlemen's is famous for perfectly aged steaks, legendary breakfasts and bottomless cups of coffee. From saddles and boots to the coolest cowgirl and cowboy hats, stop in and browse through Langston’s Western Wear, National Saddlery Rodeo & Gifts, Shorty’s Caboy Hattery or Stockyards Merchantile, all located in Historic Stockyards City. Feel as though you were born 100 years too late? Take heart - there are plenty of places in Oklahoma to find your inner cowgirl or cowboy. Island Guest Ranch in Ames, located on a 5,000-acre island in the Cimarron River, offers daily horseback riding, team penning and roping, powwows, trail rides, square dancing and rodeos from April to September. At the Hitching Post Lodging & Ranch, located in the Oklahoma Panhandle, guests can sample life as a genuine cowboy with guided trail rides and horseback riding opportunities. For all-inclusive dude ranch vacations, Western-themed lessons and cowboy activities such as roping, archery and tomahawk throwing, Meadowlake Ranch in Sand Springs offers plenty of Western fun. Guests of Meadowlake Ranch, located just a short drive west of Tulsa, can enjoy stays in teepees or log cabins, evening campfires and much more. After a stay at Island Guest Ranch, stop in at the Cherokee Strip Regional Heritage Center in Enid for an immersive experience in five exhibit galleries that interpret the settlement and development of northwest Oklahoma. Extend your stay at the Hoot Owl Ranch near Kenton. The Sand Springs Cultural & Historical Museum is housed in a pristine example of Art Deco architecture at the former Charles Page Memorial Library. The museum focuses on Sand Springs’ unique history, memorabilia, fine art and genealogical research. Western history is full of larger-than-life characters and places, and Oklahoma’s got more than a few to know and love. Established in 1925 as the country home of oilman Frank Phillips, founder of Phillips Petroleum Company, Woolaroc Ranch, Museum and Wildlife Preserve is a world-class Western destination. Paintings by Russell and Remington, a superb bronze collection by Joe Beeler and perhaps the world's finest collection of Colt handguns are just a small taste of the fascinating things to see and do. A lush 3,600 acres, the ranch is also home to herds of buffalo, elk, deer, longhorn steers and Scottish highland cattle. At the Will Rogers Memorial Museum in Claremore, art and artifacts pertaining to the life of Will Rogers, famed Cherokee humorist, film star and social commentator, are aesthetically displayed in the 12-gallery museum. Visitors will enjoy the classic movies starring Will Rogers that play daily, as well as a gift shop featuring books, CDs, videos, art and scores of souvenir items. A few miles away near Oologah sits Dog Iron Ranch, a log-walled, two-story home and 1879 birthplace of Will Rogers. The site is a 400-acre living history ranch with herds of Texas longhorn cattle and barns authentic to the era. Delve deeper into the life of Frank Phillips with a visit to the Frank Phillips Historic Home, a 26-room mansion built in 1908 in Bartlesville. The mansion, a superb example of Neo-Classical style, rewards visitors with a rare look into an intriguing phase in Oklahoma's history. Located only a short distance from Bartlesville, the Oologah Historical Museum is housed in a building built in 1890 and features artifacts from local pioneer families and ranchers, memorabilia from local schools and a gift shop. Visit the Claremore Museum of History to pay homage to the playwright R. Lynn Riggs, author of "Green Grow the Lilacs," which is the basis for Rodgers and Hammerstein’s ever popular musical, Oklahoma!